The book encompasses five different heart touching stories with simple narration to bring an awareness about the misconception about kidney (referred as Second Heart) issues among general public. These are partly based on true stories about individual experiences. The book attempts on non-technical handling of a technical issue through emotional stories. Dr. Sandeep Huilgol did his medical schooling from Karnataka Institute of Medical Sciences, Hubli and underwent his medical training at Mallya Hospital, a leading super specialty hospital in Bengaluru. During his medical training, he developed a special interest in nephrology, which deals with kidney diseases. He has published articles on kidney diseases in National daily and an international magazine apart from academic publications and presentations. During his Nephrology training, he has come across many patients with various problems other than medical that were more troublesome than kidney diseases. This prompted him to come up with an idea to create awareness among the general public about the matter. Santosh Avvannavar started his career as a consultant and Soft Skills Trainer. He did his college education from NITK, Surathkal. He functioned as a researcher at University of Eindhoven, University of Twente and Indian Institute of Science, Bangalore. He was also the Placement President, while he was working at IISc, Bangalore. He has over 25 publications of mostly research documents that have found their place in National & International Journals. Also, he has done 16 conference papers and regularly functions as a writer of different articles for a national and worldwide daily paper. He is an advisor for different organizations. Throughout his personal time he composes his thoughts on a website, namely www.amritafoundation.wordpress.com and ventures into fiction writing. He delivered seminars and training to more than 33,000 people in India and abroad over the span of 7 years. 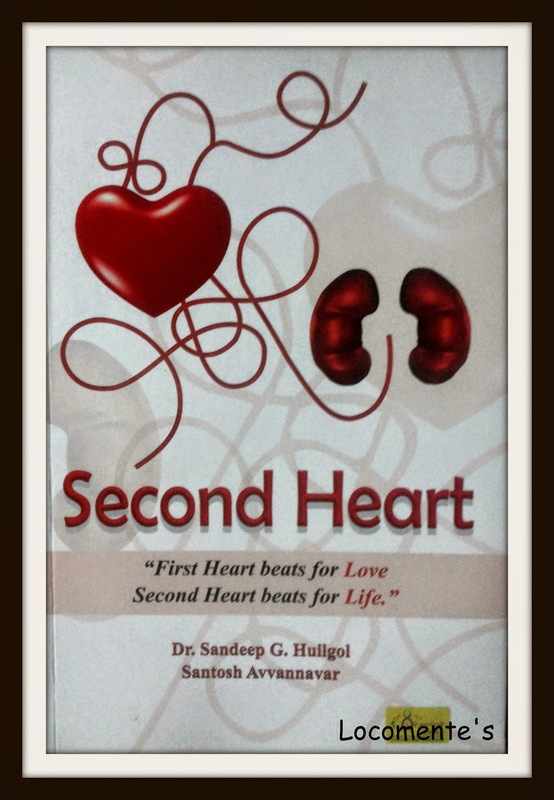 The title is simple and gives away the fact that the book is all about the second heart, kidney. The cover page includes the picture of both first and second heart which both apt and sample. The book blurb is crisp and sets the stage. As mentioned in the blurb, the book consists of five short stories. Each story talks about the causes, symptoms, after-effects and treatments for kidney-related diseases. It is put across through simple stories which includes normal characters like you and me. It was scary to find out that it is very difficult to find out kidney disorder at a very early stage. I am more than glad that the authors have taken a new path in enlightening common man about diseases. They say that a picture speaks thousand times more than words. And I say that a tiny story can speak volumes in comparison to huge thesis. The narrative is very simple. At the end of each chapter, doctor’s note is included which further elaborates the causes and effects. With as less as 78 pages, the book certainly doesn’t bore you. It could be a great companion when you are waiting for your friend at coffee shop or while just waiting to board your train! It will require less than one hour of your time. But, the value it adds is amazing! Nice review.Actually all internal parts have their function in our body. Very well said. We realize its importance only when it stops working normally!